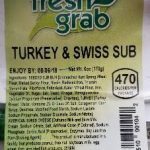 In a press release dated July 28, 2018, Lipari Foods, LLC, announced a recall for its “Premo Brand” and “Fresh Grab” Brand Turkey and Swiss submarine sandwiches, because the products may be contaminated with the bacterial pathogen, Listeria monocytogenes. The recalled sandwiches were produced and packaged by sister company JLM. 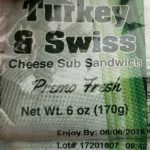 The recalled sandwiches were produced on July 17, 2018, and distributed to food service and retail stores throughout Florida, Illinois, Indiana, Kentucky, Michigan, Minnesota, Ohio, Pennsylvania, Tennessee, Wisconsin and West Virginia. Lipari Foods issued the sandwich recall after learning from its sister company, JLM, that recent routine environmental monitoring and product testing yielded positive test results for potential Listeria contamination. If you or a loved one has been injured in a food poisoning outbreak and you would like more information concerning your legal rights, contact our law firm toll free at 877-934-6274. Please see Food Poisoning Lawyer NJ to learn more about our food poisoning litigation services. Please see Blood Clot Lawsuit and C Diff Lawsuit to learn about additional personal injury cases handled by our firm.